Want to make sure you never miss an opportunity to Show Up and Speak Out to your representatives? Text TOWN HALL to 202-849-7377 for town hall alerts just for your district. Get instant updates when lawmaker town halls are announced. Looking beyond ideology and policy positions. If I wanted a candidate I agree with 100 percent, I'd vote for myself. But let's face it, most policies stated by candidates are more aspirational goals than specific plans for achieving them. And even fewer address how they plan to enact policies when 60 votes are needed in the Senate. All that said, as a Marylander, I don't vote in the primary until the Dem candidate is all but finalized. So, if I do settle on a candidate that meets my criteria, I'll be voting early with my wallet. ...when the economy crashed and the government had to bail out all those Wall Street banks and businesses that were "too big to fail." Back then they just shrugged and chanted "We're all Socialists now. Ha ha!" But now when liberals talk about health care for all or a few regulations to keep billionaires and corporations from grabbing up the entire pie, THEN they begin whining that "the Dems will turn America into VENEZUELA!!!" The hypocrites want socialism for the rich and Laissez faire capitalism for the rest of us. Probably a good portion of them are Russian trolls, but they are repeating some long-refuted claims about him being a "DINO Pharma supporter." I am proudly undecided, but I will defend ANY of our great Dem candidates from attacks like these. Booker's career Campaign Finance file on Open Secrets showing Pharma is not a big supporter. "Billionaire Boys Club." It needs to be a hashtag. Donald Trump is a billionaire, or claims to be. The last thing he is expecting from the 2020 presidential election is an opponent who is even richer. But one of the more unusual clusters in the putative Democratic field is the billionaire boys club: former New York mayor Michael Bloomberg, hedge fund investor and activist Tom Steyer and former Starbucks chief executive Howard Schultz. Estimated combined wealth: $50bn. But these are early days and corporate titans can buy name recognition. Schultz, 65, reportedly plans to travel the country early next year to promote a book entitled From the Ground Up: A Journey to Reimagine the Promise of America. Bloomberg, a businessman who recently re-registered as a Democrat, and Steyer spent heavily in the midterms to help Democrats regain the House of Representatives. Earlier this month they were on the ground in the key states of Iowa and South Carolina. Both have political causes that could make them stand apart from a highly crowded field. Apparently, the winner-take-all feature of the Electoral College makes a successful third-party POTUS candidacy a near impossibility (so says something political scientists call "Duverger's Law: https://en.wikipedia.org/wiki/Duverger%27s_law). So with all the talk about whether a Howard Schultz Independent candidacy would make him a worthy contender or a Trump-aiding spoiler, I looked into just how successful third-party POTUS candidates have been in gaining electoral votes. The short answer is: Not very. Some the most famous third-party candidates in recent years --- Jill Stein, Gary Johnson, H. Ross Perot, John Anderson, and Ralph Nader -- never earned a single electoral vote. Ron Paul, Rand's dad and the Libertarian candidate in 1988 and a write-in candidate in 2008, won a single electoral vote, but not in those years. It was in 2016, apparently the work of a "faithless elector." So, are third-party POTUS candidates legitimate contenders or just spoilers? In light of their dismal record for winning the White House, I vote "spoiler." Even Teddy Roosevelt, running as the Progressive Party candidate in 1912, couldn't pull off a win. Sure, other countries manage more than just two parties, but they don't have the Electoral College. I'm all for eliminating the Electoral College, but only because it enables GOPers to win and therefore hinders Dems. "List of people who received an electoral vote in the United States Electoral College"
There are scads of great Get Out the Vote tools online, but Multiply Your Vote offers you a list of activities to take part in. So, for instance, if you're not in to knocking on doors or phoning random people, you can send text messages. ...in most states. 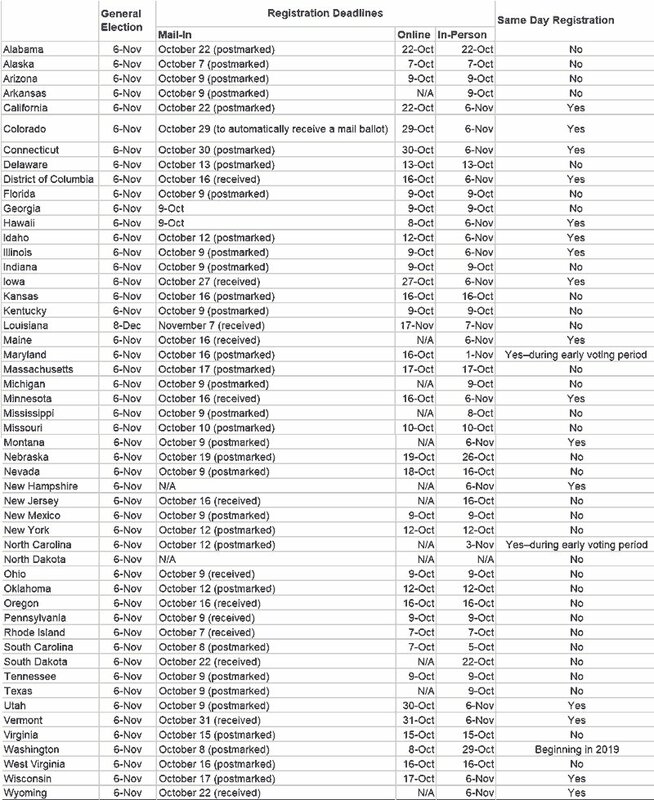 Check the date for your state in the chart below.